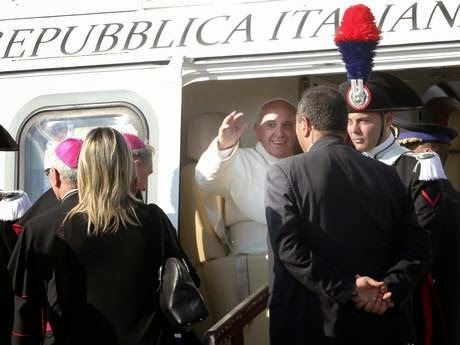 Pope Francis leaves in a helicopter from the town of Sibari, where he made the comments. In Melting Titanium No.31, iON mentioned the relationship between members of the Mafia and religion. Yesterday, Pope Francis declared that all members of the Mafia are automatically excommunicated from the Catholic Church. The pope excommunicated the Mafia, blasting a group that is thought to be the most powerful organised crime organisation in the world. The Mafia is an example of the “adoration of evil and contempt of the common good,” he said. The comments came after the pope met the family of a three-year-old child murdered earlier this year. Authorities believe that the ‘Ndrangheta are behind the killing, in which two other people died. The pope said that the church would use its full force to combat organised crime. This is the first time that a pope has used the word excommunicated in relation to the organised crime group and the church’s strongest attack on the Mafia since 1993. Then, Pope John Paul blasted the Sicilian Mafia when he visited the area after a run of murders, and urged Roman Catholics in Sicily to rise up against them. A number of churches were bombed after Pope John Paul's comments, in part because the church had broken an unwritten hands-off rule towards organised crime, experts said at the time.